They say the best way to get to know someone is by taking a walk in their shoes. 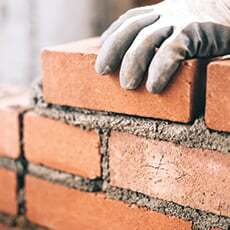 But we believe it’s by stepping inside their homes. In this series, five local designers allowed us to take a peek into their most private spaces for an intimate glance at their home lives. 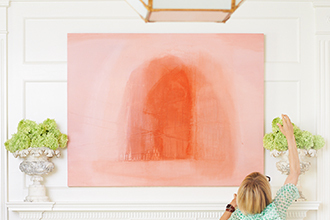 Read on to learn what’s close at heart to these designers, what pieces were an impulse buy, and what treasures they couldn’t live without. This week, we’re visiting with Leslie Jenkins. 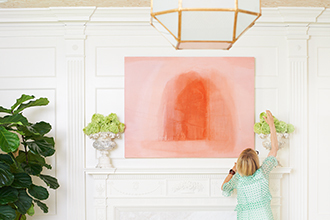 More than two decades ago, interior designer Leslie Jenkins had the savvy to shop European markets with Cynthia Collins, bringing treasures home in trunks to sell out of her house. (Friends clamored for her finds.) Her prowess has since evolved—she now co-owns Uptown interiors boutique Blue Print and adjacent Blue Print Gallery, and she mixes her Parisian and English finds in all sorts of projects through her design firm, Jenkins Interiors. A Dallas native, her own home embodies her aesthetic: an effortlessly cultivated, collected style that feels sophisticated without pretension. 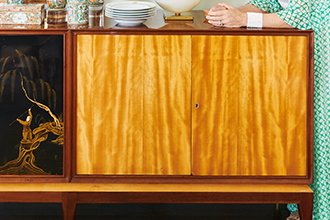 One of Jenkins’ most coveted pieces is a midcentury-era sideboard she discovered in a boutique. Though it needed refinishing, the chinoiserie center panel caught her eye. 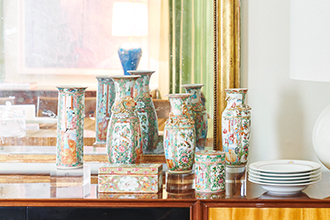 “I love a touch of Asia in every home—it gives a sophistication and looks collected,” she says. “I knew this piece would be one I wouldn’t get tired of, which is hard for me to find.” At nearly 10 feet long, “It will forever stay—I will never be able to move because I will have to have that piece, and it won’t fit anywhere,” she says. A collection of antique Asian Rose Medallion porcelain vases she found in England and France rest atop. (Left) Jenkins loves interiors that appear “curated and cultivated with a fresh, contemporary approach—my goal is to create timeless spaces that have a mystery surrounding when they were designed,” she says. Her mantra extends to every detail in her own home, where a French wine-tasting table in her dining room holds butterflies encased in glass found in Paris, as well as other European finds including a silver tray with several tortoise, mother-of-pearl, opaline, and lapis boxes, which she collects. 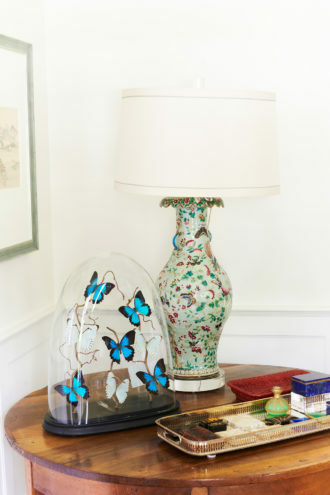 The lamp was originally a celadon vase she had mounted on Lucite and converted into a light fixture. (Right) “Maybe he’s a deer, but we named him a reindeer,” Jenkins says of her Parisian butler sculpture. 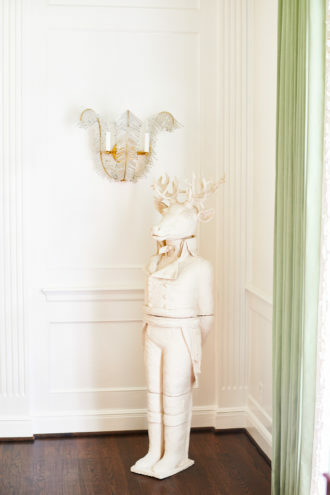 “I originally intended to put him in my entryway but realized his place was in the dining room.” At Blue Print, several similar white terracotta animal heads can be found. “I always wanted one of [the artist’s] full-body sculptures and finally decided I had to have it,” Jenkins says. (Right) Jenkins’ family room overlooks the backyard, so she added a breakfast nook where she can sit to watch the sun rise. The brass chairs and table are from Blue Print; the painting is by Memphis artist Cathy Lancaster, also represented at the store.